If imitation is the sincerest form of flattery, then Giancarlo and all the good people of L’Eroica should be honored. 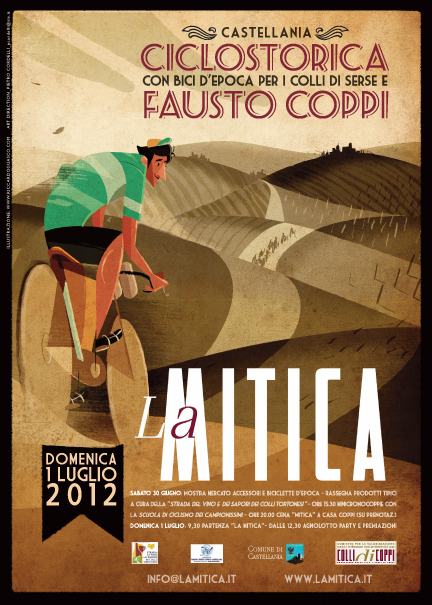 In the home of Fausto Coppi comes La Mitica. While I have every intention of riding another L’Eroica, I’m eager to ride this and the Retro Ronde. It’s not a slavish interest in the minutiae of vintage bicycles; it’s the culture that surrounds the period when bike racing was not dominated by expensive sponsorships, radio communication with the team, armadas of support vehicles. Don’t get me wrong. I’d jump at the chance to spend some time as a spectator at Grand Tour events. And, I watch plenty of TV coverage of the pro circuit, attend local events and read as much as I can. But, there is something that inspires me about participating in events like this. You feel somehow more connected to the origins of the sport and to a time and place that seems original. I fight the cynic in me that says these events are produced as a way to build tourism interest, especially among people “of a certain age” who have the means to travel and harbor nostalgia for a period they probably never lived through. No matter. It can only be a matter of time before an event like L’Eroica or La Mitica is held here in Oregon. For that, I cannot wait.